She marched out of the lake, so they say. With her back bent, wrinkles mapping her determined face, she raised her hand and the passive waters came alive. Hundreds of cows, goats, sheep, donkeys and all manner of domesticated fowl followed in her wake. The braying, moo-ing, baa-ing and clucking jolted the poor fisherman from his disbelieving stupor. Out of a barren night of unsuccessful fishing, Nyamgondho was going home not only with vast wealth, but also with a new wife. The tumultuous marriage and wealth does not last though. Unable to stomach any more of her husband’s ungratefulness and co-wives taunting, the old lady disappears into the same waters that she came from. In tow was all the livestock and their offspring. They say that on the particular spot she disappeared, Nyamgondho’s solidified statue still stands. With his face sorrowful and his body betraying how he had begged for her not to leave him. Not so long a journey from Kendu Bay town is a small water body dubbed Simbi Nyaima, a Dholuo term that translates to ‘the sunken or drowned homesteads’. The waters of Simbi Nyaima are believed to be sacred and medicinal. At present there are two bodaboda operators blessing their new bikes with these waters before they venture into the business. A local religious leader adorned in colorful regalia mumbles prayers as he sprinkles water on the bikes with a flywhisk, armed with a long walking stick that he uses every now and then to point at the bikes. The bikes themselves are covered by big, red “holy” cloths. Politicians come to pray over this waters that the electorate might vote in their favour. People with various ailments such as skin infections believe that when you bathe in these waters, your skin is cleansed. And if you want a wife or children, the locals believe these waters have magical powers to grant you your wish. The Luo of this area believe the old lady in the above story appeared here after her escapades by the shores of Lake Victoria. She left her mark here too, this lady who apparently has no name. After the villagers who inhabited this particular village refused to accord her hospitality despite enjoying a bountiful harvest, she invoked a storm over them and all the villagers and their property disappear overnight. It is said that on some days, moo-ing, baa-ing and clucking can be heard from inside the waters – an eerie reminder of the village that perished. I am on the trail of the 6th edition of the Rusinga Cultural Festival. 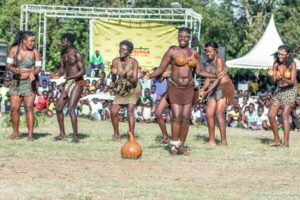 Held annually on the Rusinga Island of Lake Victoria, this incredible festival seeks to celebrate and nurture the Suba Culture that is shared among the Suba people of Rusinga, Mfangano and Takawiri Islands. The Abasuba of Kenya settled in five regions in Kenya. The mainlands of Gembe, Gwassi and Kaksingri and the islands of Rusinga and Mfangano. The Suba people and their culture has been assimilated by the Luo one over years of contact. For years, the debate about what is Subanese* and what is Luo has raged. In fact, the story of Nyamgondho wuod Ombare is claimed by both communities. 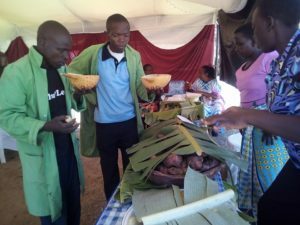 “The aim of this festival is to provide a platform for the revitilization of the Suba Culture by showcasing the different elements of the Suba Culture such as food, sports, artefacts, dances and history. The festival also promotes the Suba region as potential tourist attraction sites and hence impacting on the socio-economic life of the Abasuba. ” says Anne Eboso, the festival founder. 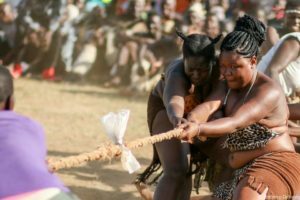 And the festival itself does not disappoint – we are treated to games such as Oluko (board and marble game played by men), Eminyiika traditional wrestling and okukulana kwa engoe (tug of war), okuidiewana kwa amaato (boat races). Here, it is a showmanship not just of muscles but of wit, as the opposing teams and individuals have to think quickly on their feet in order to outwit each other. At Luore Beach, 4 colourful boats await. 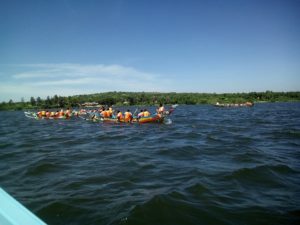 Traditional dancers are at hand to usher in one of the activities I fell in love with – boat racing. Sponsored by the US Embassy in Nairobi, the activity has separate races for both men and women. Each boat has a team of 7. It is a glorious showcase of not only racing skills, but of team work and coordination as the teams battle it out. The Kenya Maritime Authority is at hand to offer marine safety skills and equipment such as lifejackets. 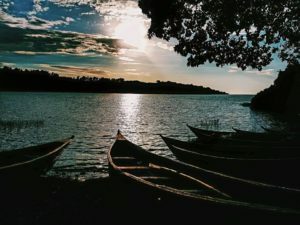 Given that Rusinga economy is highly dependent on the lake for fishing and also for travel between the islands, this is an important aspect. The US Embassy also supports literacy on the island through a floating library – a boat that ferries storybooks and readers across the three islands once a month. I spent most of my time at the cultural restaurant on site.The purely organic dishes were mouthwatering, luring one to eat more than their fill without feeling guilty. From Amabuoni (sweet potatoes), Owusera with agwata (fermented porridge served in a calabash), boiled maize, millet flour Owuita (ugali) soaked in traditional ghee, a variety of fish cooked with different styles, Omutanda (dried meat) and fermented milk, the restaurant was a foodie’s dream come true. What struck me even more was how the community was involved in preparation and implementation of the festival unlike most other events I have had the pleasure of sampling. A woman tells me that depending on the intensity of the sun, the drying of meat that is used to prepare the Omutanda dish can take anywhere between 3 – 6 weeks. The wrestlers and boat racers and all those partaking in other sports prepare weeks or months in advance. The festival serves as a catalyst that creates a whole economy around it. The food that is served at the restaurant is wholly sourced from local fishermen, prepared and served by the village women thus boosting their economic standing. This extends to the hotel and tourism industry in the area – a random check showed that most hotels in the area were fully booked with guests checking in on the 20th and out on the 23rd (this year’s festival took place on the 21st & 22nd December). Some unexpected guests from Nairobi have called requesting for assistance in getting accommodation. We call one of the hotels, it is fully booked. 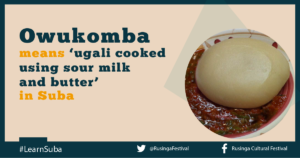 The festival also provides space for organizations that would otherwise never have any tangible contact with the Rusinga Community. Even Pwani Oil is here all the way from Mombasa. Not only do they have a beautifully crafted stand where they are selling their products at ridiculously discounted prices, but are the official sponsors of the cooking, donating cooking oil to be used, khangas for the women cooking and a variety of bathing and laundry products. 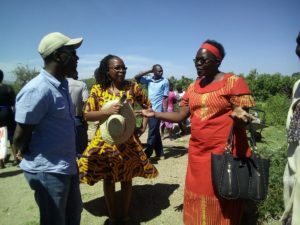 This year, in addition to the other activities, festival participants were treated to a tour of the neighboring islands and Ruma National Park in Homa Bay. With the Kenya Tourism Board promising to consider a bigger partnership package next year, this is a festival whose space is worth watching as it opens frontiers not just for Rusinga and and the other islands but to the Homa Bay County as well. Something gnaws at the back of my mind. If the festival seeks to promote the Suba culture, how come then that most of the programme is delivered in Dholuo? I ask Anne. “Being an endangered language, only a handful of islanders here speak Suba – most of them aged 60 and above. On the other side, almost everyone speaks Dholuo hence it is the language of choice for the festival. However, we try to incorporate Suba elements by having the opening prayers delivered in Suba by a Suba elder and having some sessions translated by a Suba MC”. She says. Yes, the Suba language is enlisted as endangered in UNESCO’s Red Book of Endangered Languages (2003). Any hope then of the festival promoting the language? Yes, she says she is working on introducing informal Suba language classes in future editions. This way, the elders can teach the new generation. Given that I interacted with a good number of festival attendees – natives of the island, who live in other towns as well as outside the country – who had come home specifically to sample the event, this would be a welcome move. Rusinga is a storytellers’ haven. 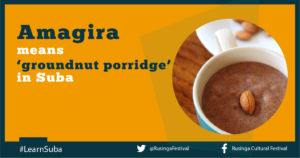 If you want to unwind in a picturesque, inspiring environment as you research, write or just bum around as you enjoy what nature has to offer, Rusinga Island and the festival is definitely for you. PS/ Every year, the festival takes place on the last Thursday and Friday before Christmas.